Could you guess in which country? It seems extremely unlikely that something so simple could possibly be creating power, and there's no real way the purported extra power could be coming from the Earth's magnetic field, as Jones was talking about at 9-11 Flogger. It's been a long time since I did the Physics of Electricity and Magnetism; could it simply be that Jones has charged up the capacitor (which acts as a storage battery), and then when he reduces the power from the AA battery the power in the capacitor is released, and hence he gets the Pout>Pin that he's claiming? Joshua Blackeney (sic), a well-known Canadian 9/11 nut case, is connected through Facebook to Bradley Smith, the 'founder' of the Committee for Open Debate and the Holocaust. Yes, it is a Holocaust Denial kind of thing. Blakeney posted on Veterans Today, his professor Anthony J. Hall's review of Kay's Among the Truthers. This development helps block wider appreciation in Europe and North America of the historic and continuing importance of Islam in the genesis of Western civilization, global civilization. The sacred myth of 9/11 helps renew the old imperial ploy of divide and conquer. By highlighting issues of religion and ethnicity as the primary cause of, and justification for, global conflict, the sacred myth of 9/11 diverts attention away from the huge and growing gap between rich and poor. Hall's review is extremely long, and largely boils down to griping that Kay doesn't engage in a point-by-point debunking of 9-11 nuttery. Of course, point-by-point debunking doesn't impress the Truthers anyway, as can be seen by their reaction to the Popular Mechanics book. Years before I met and married Ernst Zundel and, thus, became a Holocaust Denier – because this malady, Denial-of-the-Holocaust, can be infectious, in case you didn’t know! – I made my living as a kiddie shrink: in academic parlance, an Educational Psychologist. Once Ernst and I became a team, he asked me to do a monograph on “The Impact of Words on the Mind,” by which he hoped to neutralize the virulent character assassination of an entire people, the Germans who fought World War II, unleashed on them sans mercy by another set of bipeds, the Victims of the Holocaust. The latter try to run down every last “War Criminal” on earth. The former seem without defenses. I'm not saying that Blakeney himself is a Holocaust Denier. But he sure has a lot of connections to them. I was surprised to find out that David Ray Griffin is not only still vertical, but visiting Seattle this weekend. Dr. David Ray Griffin, author, professor, theologian and author of thirty books will address the reasons for questioning the official account of 9/11 and will respond to Bill Moyers and other critics of the 9/11 truth movement. I would go and say hello again, but they actually want $15 to attend. Hell, I got into Thor 3D for $11.50. Well that and it is a three day weekend and I will probably out of town. 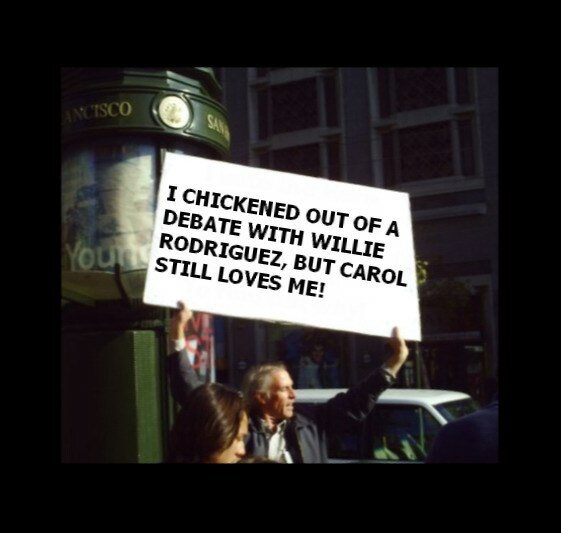 Willie doesn't have the guts to debate me--not here, not in person, not anywhere on the internet, and not on Carol's program. That's because he knows better than anyone that he's a liar and a fraud. 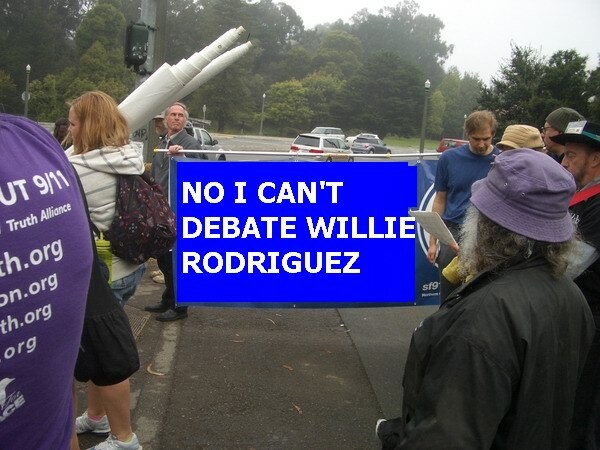 As I wrote last week, Willie offered to debate Brian right here at Screw Loose Change (allegedly part of the internet the last time I checked). And suddenly Brian started making clucking noises and pecking at the ground. I guess we all know who's the liar and the fraud, eh? I offered a debate taking place on Carol's radio program. The reason for this is that Willie lies, and he hides behind Carol's skirts, and he would surely raise untrue ad hominem attacks on me with no regard for the potential damage to Carol. So she needs to have edit power over the debate. Sadly, Brian is totally obsessed with attacking Kevin Barrett and William (and indirectly- me). It started when he came to the erroneous conclusion that I was in love with Kevin and had a sexual affair with him (and possibly others- including John Wright- he even insinuated that William shared my bed when William was out for the event we did in 2007). He blames William and Barrett for ending our friendship- when his mistrust of me and Brian's bad judgement and jealous attacks of Kevin and William were the main catalysts for my cutting all contact with him. When caught on this, Brian shifted to demanding a debate on Visibility 911. Willie contacted Michael Wolsey, who hosts that program and the response was pretty simple. "We'd love to have you on the show, Willie, but why would we include Brian? He's a nobody." Which is probably the response we all should have. Brian's certainly given us some amusement over the years, with his rakeonrake and meatball on a fork meanderings, but in the end he's just a footsoldier in the idiot brigade. It kind of reminds me of Sibel Edmonds' demand that she get live airtime on a major network to tell us all that she knows; as you can imagine the networks have laughed at that suggestion. Of course, Brian Good is 1/1000000th as important as Sibel, so he can't even get on a conspiracy theory podcast. Very entertaining. I don't agree with any of the three viewpoints shown, but then all three are caricatures. Some amusing bits with the Deather/Truther. Either the first responders will start dying in droves, the way Gold, Feal and Alex Jones claim, or they won't; it's a debate that will be settled in time and battled out in the annals of the New England Journal of Medicine. If only I could trade one 9/11 first responder's life for this despicable piece of ****. If 9-11 conspiracy theories were just about the air quality, I'd let it go. Either the first responders will start dying in droves, the way Gold, Feal and Alex Jones claim, or they won't; it's a debate that will be settled in time and battled out in the annals of the New England Journal of Medicine. What I was saying there was what I have said consistently. I don't know if the claims that illnesses in the first responders resulted from the air quality at Ground Zero are true or not. I hope they are not, not because it would make Gold and Jones wrong, but because I don't want the first responders dying in droves. It's a debate for the medical professionals to hash out over time, with studies that will certainly be published in respected periodicals like the NEJM. I should note that the most famous case of a first responder dying, James Zadroga, does not inspire confidence that the epidemiology will be separated from the politics. It is apparent from reading this article that Zadroga's death was not brought on by exposure to chemicals and fumes on the pile, but from injection drug use. The type of material found in Zadroga’s lungs was also significant. Talc and cellulose are widely used pharmaceutical ingredients, Hirsch noted, but neither was considered a major respiratory hazard at Ground Zero: talc because it wasn’t found in the air in abundance; cellulose because it is not considered particularly hazardous. (The molecules are too large to pass through the elaborate filtering apparatus of the upper airway.) 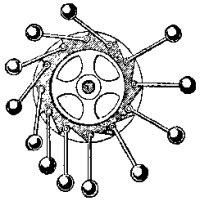 The absence of needle marks Hirsch deemed insignificant, because clean needles cause less scarring. The truth of this is hard to gauge. Four months after meeting with Joe, I wrote to the Zadrogas’ lawyer, who agreed to fax me a copy of the results of James’s 2003 biopsy, the one that Joe had said showed extensive lung damage. The document that arrived was eight pages long: a comprehensive report on the various tests and their findings. But its import was unequivocal. The lungs had only minor abnormalities and showed no evidence of talc or cellulose. When I contacted a pathologist unconnected with the case to ask whether this could have been an oversight, he scoffed, explaining that, under the polarized light that labs use to spot foreign particulate matter, such particles shine out like stars in the night sky. Had the material Breton found in Zadroga’s lungs in 2006 been there in 2003, it would have lit up the lab. Well, the 1500th consecutive fiasco has hit the Troof Movement, just as Box Boy Gage was about to celebrate the 1500th architect or engineer or secretary at an architectural firm or subscriber to Architectural Digest to join his group. You may recall that back in March, Richard Gage engaged in a debate in Colorado with Chris Mohr. Mohr basically pretended he was Brian Good and Gage was a mop, and so the result was so bad that even the delusional idiots at Flogger admitted that that Gage was beaten badly. A DVD will be created in the coming months of the event from the high-definition video footage shot by a three-camera film crew led by Ken Jenkins, video director for the AE911Truth DVD’s and the 9/11: Blueprint for Truth and SF Press Conference. We hope to air the WTC 7 show on local PBS-TV stations. Stand by to order your copy from our online store in April or May. There has been considerable discussion between me and Richard Gage's AE911 Truth organization about the debate video. As you know, when the debate happened on 3/6/11, they recorded it with three video cameras. The hope was to put out a high-level professional video that could be used on PBS or at least community TV stations and cable outlets. Ultimately, they decided not to edit and release this debate video after all. They are moving on to other projects. Adding it up, six people moved away from the Troofer position (including one full switch from CD to natural collapse), while only three moved towards Gage's theory (none from natural collapse to CD). This last week was a nightmare for me, you have no idea under what pressure I have been and how many people contacted me, warnings that I should keep quiet... and in the end, yesterday, I had a personal visit after leaving my day to day job. I had the impression that I live in a free country but it was demonstrated that anything is possible, we will never move forward. Romero had seemed very sincere and open about his device. It was also a hard slap in the face to everyone who had been preparing to replicate the setup. Forum members had invested their time getting ready to replicate, sacrificed materials in order to fabricate rotors/stators, and even spent their hard earned money purchasing components. As Romero stated in one of his posts, the device was not cheap to build. He expected the cost of a slightly larger scale version of the device to cost around one thousand dollars. Yes, you heard that right, ONE THOUSAND DOLLARS! The idea is based on a child's see-saw or teeter-totter. I'm sure most of us remember that if two children of the same weight got on one of those, but one moved closer to the middle while the other sat out at the end, that the former would be lifted in the air. So it makes sense that if you have extended weights on one side of a wheel, and the weights move in after they reach the bottom, that the wheel would turn. But the diagram above also shows the design problem; as you can see there are only four weights doing the work on the right side, while there are 8 weights being pulled upwards on the left. Note as well that although the story ends with the wheel still spinning, there is no mention of it doing any practical work, like generating electricity. With four months to go before the anniversary, does he really think this is the best strategy for bringing good publicity to nanothermite? I wouldn't be surprised if there are hairy hominids running around in British Columbia, but I don't think they're the best use of my time right now. Note as usual the focus on PR, not the actual topic at hand. It's not whether perpetual motion or earthquake machines are nutty, it's whether they will make the Truthers look nutty. Dr. Jones is certainly entitled to look at anything he wants to on his own time. Frankly I wish he would look at the possibility that high-tech secret weapons were used on the twin towers, because I've never been able to see how gravity, conventional explosives, thermite, or nano-thermite could have pulverized the concrete floors of the twin towers in mid-air. I can't help wondering if Dr. Wood's incompetent assertions about exotic weapons was intended to make the whole field unpopular. Yep, as we have noted in the past, Richard Gage is every bit as crazy as Judy when it comes to the "missing floors" and "pulverized concrete", and PetGoat Good isn't about to abandon Box Boy. Even if Steve were investigating the idea that politicians might be reptiles from another planet, he is ultimately a scientist -- has been for his entire career -- and he would conduct an experiment and discover that the hypothesis had no basis, and move on. He doesn't just make fantastic assumptions and then publish them on a blog and say "it must be that way!" (ala David Griscom). Steve conducts research. But isn't that the problem with reptilian theories--that there's really no way to test it? Rolling Stone magazine has an entire section on conspiracy theories this month, mostly based on the recent Jonathan Kay book Among the Truthers, including both an interview with the author and a breakdown of the types of conspiracy theorists he identified. I will be posting a review of the book as soon as I get a chance to read it. I was amused though to find my name in the index, right under "Benedict XVI, Pope". Conspiracy, or just an alphabetical thing? Gage will admit that he’s paid a price. Friends who failed to embrace his missionary zeal have drifted away. So has his wife, who he said had difficulty accepting his “dark” vision. Gage now lives by himself in a home office near Berkeley, paying his bills with the modest amounts he earns through donations. Yet when Gage discusses all this, he seems curiously upbeat—almost euphoric—like a Benedictine monk who’s happily renounced the material encumbrances of secular life. Although he doesn’t talk much about his world before 9/11 Truth, he clearly remembers it as empty and unsatisfying. As a reminder, those "modest amounts" equaled $75,000 in 2009; I'm still waiting for Guidestar to post the 2010 figures. Most liberals, if they listened to Rush Limbaugh, would not be pulling off the road to absorb it all and saying, "You know, he's right!" Ditto with conservatives taking in Ed Schultz. And when Gage recently hired a publicist for his group, whom did he choose? Ilene Proctor, who bills herself as "The Public Relations Princess of the Political Left". Actually, he comes off as a dimwit. A DNA testing kit isn't standard equipment on a Navy SEAL's belt? Gee, what a brilliant quip, until you realize that this wasn't a standard raid. Do you think maybe the SEALs knew they were going to make an attempt at Bin Laden, so they brought along non-standard equipment for the purposes of identifying the target? He talks a lot of sense, and to those talking about having a drink is a sad attempt at being edgy, he's not doing it for that. He's an alcoholic and feels he can perform better drunk so he drinks. Almost all drunks think they're amazingly funny. From an article on a Richard Gage appearance in Minnesota. Not exactly Charlie Sheen money, but probably more than Gage ever got paid for 2 hours of his time as an architect. Organizers of the St. Paul meeting said they paid Gage a $500 speaking fee. In return, they got more than two hours of Gage narrating a PowerPoint presentation of nearly 700 slides, which focused on the Twin Towers, as well as a third building nearby, the 47-story World Trade Center Building 7, which collapsed that day after catching fire. According to Gage, eyewitness accounts, slow-motion video, technical analysis of the dust from the disaster site, suspicious reports from the media and the unlikely collapse of Building 7 all amount to "massive, overwhelming evidence" of a vast, sophisticated conspiracy involving controlled explosions set off inside the buildings. "This is not America as we used to know it," Gage said. "We're not being told the truth about these events." He invited audience members to sign his online petition, to give a tax-deductible donation to his organization and to buy his $20 DVD. But 700 slides? Really? This guy needs to take a class on giving presentations. Guess it works for propaganda. Senator Mark Dayton already accused NORAD of lying, and Commissioners Kean and Hamilton wrote in their book that NORAD's shifting stories so angered them that they considered referring the matter for a Justice Dept. investigation. But you'll never get the debunkers to admit it. You can quote the book and the news article and they'll just claim you're lying and taking stuff out of context. I bring up the NORAD lies 3:00 into the debate with Jon Gold. The NORAD lies come up again at about 7:30 and at 8:30 I say "I think it's unconscionable the way that they lied to the commissioners and that was something they should have considered referring for criminal indictment." Just call him Brian (Not So) Good (with the Truth). Journalist Jonathan Kay is on Canadian radio discussing his new book with Richard Gage, Paul Zarembka and Barry Zwicker. Not much came out of it, but it is amusing how polite Kay tries to act towards them, to which they respond with absolute contempt and attack his book constantly for even the smallest perceived transgression, rather ironic for a movement known for its loose intellectual standards. I have no doubt that the Troofers will seize on this revelation to claim that obviously it could not have been Bin Laden that our forces killed a couple of weeks ago, because he is a holy man and regularly decries the decadence of the West. Somebody must have informed W-Rod of Brian's challenge because today I received an email from Willie offering to debate Brian live, right here on Screw Loose Change. Obviously we have to work out the details, but I am sure that Brian will agree to the debate in principle, given what he wrote on that thread. 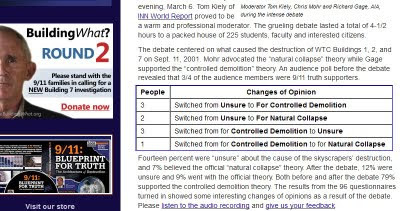 Those who go with wild theories such as no-planes-hit-the-Towers and space-beam knocked the Towers and WTC7 down (both promoted by Fetzer/Wood) OR mini-nuke destroyed the Towers. Destruction starts at the top, since the energy-beam is from space -- totally ignoring facts and publications to the contrary. No experiments. But entertaining. They fight against the science group, too. 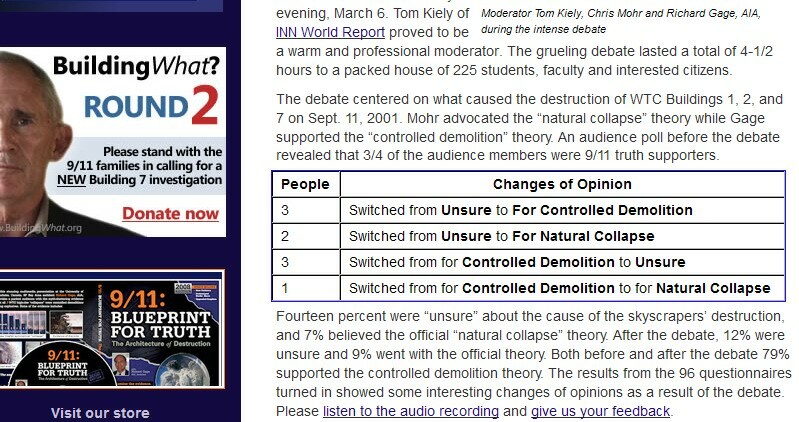 On Coast-to-coast radio, Judy Wood said that WTC 7 was "dustified" -- what a load of bull manure, flying totally in the face of facts that the rubble piled rather neatly on the WTC 7 footprint -- Observed! She also argued that the falling buildings could have produced the observed thermitic material, from iron-dustified- turns to rust on the way down, combining with aluminum from the building. Unbelievable crap. Earthquake inducing devices Prof. Jones? Sounds like a wild unsupported theory to me that will certainly do a good job of making us sound and look crazy. The evidence supporting the existence of Earthquake inducing devices is considerable and growing, along with statements by Sec'y of Defense Cohen (and Z. Brzezinski) of their existence. You would do well to attend my talk, or get a copy of the DVD of it. After you have seen the hard evidence presented, you may wish to withdraw your statement that this view is "unsupported." However -- I hasten to add that this is not something that I can do direct experiments on. This is not on a par, in this sense, with my 9/11 research. I have to wait for the grid-patterns and cluster-patterns to appear where there are no known earthquake faults, and gather and analyze the data. This I have done. Jesse Ventura, on the Alex Jones show, goes from mostly nutty to completely nutty. Admittedly it wasn't a very long trip. No, it's not going to be a mock trial, although they've already got some nitwitnesses, including Box Boy Gage, Earthquake Machine Jones, Waterboy Ryan and Pearl Harbor Griffin. And no, it's not going to be a tribunal, even though there are three "moderators" with terrific credentials. One of them is an English professor, another is an Anthropology prof, and the third is a professor of Public Administration. A serious, careful and informed trio of lunatics. There's also going to be a group of 3-5 panelists, although their function and identities are unknown as yet. It is obvious that this distinguished group will arrive at the TRUTH and disseminate it to the world. Or get a nice little trip to Toronto. Nothing serious? What about the videos of Osama meeting with some of the hijackers? And the idea that he should have been treated as a "suspect" is ludicrous. If we had tried to go through legal channels, does he really think that Pakistan would not have warned Osama? The Pentagon has released videos seized during their raid of Osama bin Laden watching himself on television. Apparently he is a bigger egomaniac than Jon Gold. Conspiracy theory polymath Michael Ruppert is arguing that the government is lying about bin Laden because they could not have completed DNA tests in the time frame that he lays out. Now the most logical explanation is simply that the initial identification of the body was visual, it wasn't until actually later that the DNA testing was completed. Aside from that though, don't you find it ironic that the movement that brought us Directed Energy Weapons, remote controlled 757s, voice morphing and supermagicoinvisonanothermite can't comprehend that the government could have invented a one-hour DNA test? I am just asking questions here. I suppose I shouldn't be surprised, after all these were the brainiacs who argued that Muslims are not allowed to wear jewelry and were confused as to why Osama bin Laden would be writing with his right hand. 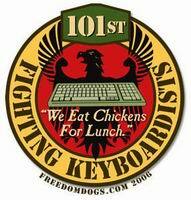 But here it is from a 911 Flogger comment on Osama's recent demise. If the Bin Laden Lynching Raid at the "mansion" was staged, we need to figure out who the "wife" and kids really were. Have there been any DNA tests on the kids? Will there be? Probably not, to keep them in custody and "protect them" from the lime light. So they have a plausible reason for not letting anyone independently verify who they were. We just have to accept their story. * the most wanted man on Earth, who was in constant danger of just such an attack? * What wife would want to sleep with a man twice her age? . * What wife would want to share him with other wives and sleep with him once a week? Well evidently she didn't get her latest issue of Ms. magazine! I downloaded this a few days ago (MP3 file), but it seemed almost quaint and trite to discuss in the aftermath of Bin Laden's death. David has apparently recovered enough from last summer's stroke to go back out on tour. This year's version is apparently to be entitled, "Why Does Bill Moyers Accept Miracles?" but you can be sure that Grifter will be performing all his greatest hits, including "Flight 77 Didn't Hit the Pentagon" and "The Phone Calls Were Voice-Morphed". Opening-13:00: Griffin and Barrett discuss the origin of David's trutherism. He was "late" to the party, not getting into it until 2003 when a colleague turned him onto a website. What site is not discussed, but I suspect it's Eric Hufschid's. 13:00-18:00: LIHOP versus MIHOP. Griffin comes down firmly in the MIHOP camp, stating that the WTC controlled demolition evidence is very strong and therefore LIHOP is no longer tenable. 19:00-30:00: Griffin urges more time be spent on the Pentagon in the Troof Movement, precisely because it is so controversial. Brief discussion of the April Gallop lawsuit. 30:00-End: Faked phone calls. Yep, no kidding, Grifter spends almost half of the interview expounding on his view that the phone calls were faked. We get voice-morphing. We get Deena Burnett's caller ID showing her husband's cellphone was used to call her. And (most annoying of all) we get Grifter's speculation that they were not confident of Todd Beamer's voice morphing and so that's why he didn't want to talk to his wife. No, you lying con artist, that's not the reason why. Beamer explained to the operator that his wife was having a difficult pregnancy, and he didn't want her to lose the baby. Grifter closes up with the Barbara Olson phone calls. I'd call him a maggot, but that would be an insult to baby flies. As spontaneous celebrations broke out in the hours after the nation learned bin Laden was shot dead by U.S. forces in Pakistan, Mendenhall used the social media site to denounce the response. "What kind of person celebrates death? It's amazing how people can HATE a man they have never even heard speak. We've only heard one side," Mendenhall wrote in a message posted to the social media site on Monday. Some Twitter users responded by asking if Mendenhall would have said "the same thing when people celebrated Hitler's death," others said it was "ignorant" to give bin Laden the benefit of the doubt. Mendenhall posted a series of about six Tweets, including one questioning whether the collapse of New York's Twin Towers was actually the result of al Qaeda hijackers flying planes into the buildings. "We'll never know what really happened. I just have a hard time believing a plane could take a skyscraper down demolition-style," said Mendenhall of the tragedy on September 11, 2001 that claimed 2,752 lives in New York City. The official story regarding 9/11 is false. This conclusion is not mere conjecture as it is supported by ample hard evidence and peer-reviewed publications, which Dr. Steven Jones will review briefly. As the planet is experiencing more and more large-scale "tectonic" events, especially of late with devastation to both Haiti and Japan, he will also ask the audience to consider clear evidence for the existence and testing of earthquake-inducing devices. Doc Marquis was raised as a child in the international, occult group known as the Illuminati. For 20 years he was trained as an Illuminist and attained the rank of a Master Witch (a 3rd level Illuminist). It took him 20 years to become a master witch? Slowpoke, I say! I got one of my characters in Worlds of Warcraft up to that level in only a week and a half. Considered one of the world's foremost metaphysical leaders and a gifted Hyperspace Intuitive, Stewart A. Swerdlow has the ability to see auric fields and personal archetypes as well as read DNA sequences and mind-patterns. He is renowned for his cutting-edge research in health, politics, spirituality and the paranormal. 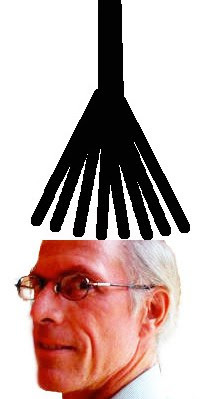 Anthony J. Hilder produced the Illuminati CFR Records in 1967. It was an enormous seller and the first recorded Expose of the Illuminati in the history of the World. Hilder was the Executive Vice President of Laird International Pictures, the same film studio which produced Gone With The Wind, Citizen Kane, The Greatest Story Ever Told and the original King Kong. He has been an Investigative Journalist, War Correspondent, Syndicated Talk-Show Host and did the Star Endorsements for Senator George Murphy & Senator Barry Goldwater. He is the Producer of 32 Documentaries, including 9-11 the Greatest Lie Ever Sold, which is in 23 countries and 7 languages. He is the producer of Frankenfed- the Monster Amongst Us, Skull & Bones - the Catholic Connection, the New World Odor, and Reischstag 95 with Ted Gunderson. Hilder is the Author of the War Lords of Washington with Colonel Curtis B. Dahl, President Roosevelt's late son-in-law. Hilder has created the Freeworld Alliance, the antithesis to the United Nations. It calls for the formal recognition and independence for the Tribal, Linguistic, Racial, Religious, Political & Ethnic Nation States. Hilder's goal is to incite a Revelation - to avoid a Revolution. Jose Escamilla has been involved in the research and investigations of aerial phenomenon he discovered in 1994, called RODS. His expertise as a film and video editor of over 27 years has made him a world renown figure in the world of UFOS, RODS and the Paranormal. His development of professional protocols for filming UFOs and RODs that eliminate all practical explanations has given him the appeal to millions of UFO and RODS enthusiasts worldwide as the one and only researcher in the world that has brought forth the most extensive proof of the phenomenon and other UFOs. Douglas Dietrich will candidly discuss his transition from adolescence to professionalism while primarily being recognized for running the ovens of San Francisco's Presidio – site of the establishment of the United Nations (over desecrated Tribal Burial Grounds) and controversial experimentation on both man and beast within Presidio's Letterman Army Medical Center until Base-closure in 1994. Douglas' career as a Military Reference Technician responsible for document destruction forced him to confront the impact of occult warfare on U.S. military mentation via paranormal operations and ESP-ionage – strategy provoking initiatives such as utilizing Tesla-derived "Montauk" technology (i.e., HAARP) to contain and control Dævil(s) summoned in wake of American Genocide(s). Those consarned Dævils are very hard to control, I tell you! And those are the featured speakers; Dietrich is top-billed. Sofia Smallstorm (aka Shafquat) of 9-11 Mysteries is also featured, discussing her new research into chemtrails. Among the "special guests" is Richard Gage. Ten years since the senseless, heartless murder of my husband and 3,000 innocent others, final justice has been meted out -- though not swift it is certainly sweet. "To say that I'm happy that he was killed just seems odd, and it goes against my Christian faith," she said. "The girls and I were talking about it this morning and one of them said, 'what can we say, Mom? We can't say praise the Lord, he's dead.' I said, I know. You just have to know that someone else made that decision and that he will now stand before judgment for having killed so many people." Because, you know, it wouldn't have been politically expedient to have it announced, say, prior to the elections in 2006 when the Democrats took over Congress? A new term has already been coined for those like Watson and Sheehan: Deathers. When will they start demanding to see the "long form" death certificate? President Obama announced tonight that U.S. special forces killed Osama Bin Laden. That's great ... but we could have killed him years ago. Bin Laden has almost certainly been dead since December 2001, when far more reliable reports of his death were published. That means the guy they killed and threw in the ocean must have either been a ghost, or one of Bin Laden's many reported doubles. Beside the fact, that this picture, and you know you can't go much by a picture, but I read a lot about him, and he was known as a very remarkable young man. As a student at school, when people would say, have a bet or something where they needed people to hold money, it was always bin Laden that they would give it to, because he was the one person that everybody could trust. He was known as a very pious, honest person. And the fact that we have made him into this demon is probably a terrible thing that we have done to his memory. No word yet on who will hold the bet money in the future. Even my wife today was texting all her friends and relatives about what an obviously sham story this bin Laden news was. Ha!...She remarked about "how convenient" to wait until after The Royal Wedding. Is it a prelude to another 9/11? I think we have to be very wary that it just might be. Why didn't any Joint Special Operations Command (JSOC) sharp shooters (the best in the world) hit Bin Laden in his gun hand, or his kidney dialysis machine. They could have captured him alive, to collect the $25 million reward. Plus, there was an $2 million bonus from the Airline Pilots Association. James Arness could easily have shot his gun hand. From the hip, no less. As we've often noted, the Truthers seem to get their ideas of how things work from movies and TV. Osama Bin Laden the terrorist SUSPECT! who has never been convicted of any crime in any American court,along with his son who has never been convicted of anything in his entire life and a few women who were innocent civilians have been killed by terrorists. What are the odds that Osama Bin Laden would bite the bullet on the fifth anniversary of this blog? Something like 75 trillion to one? Of course, he sounds positively erudite compared to the apparent star of the upcoming flick (from Wake Up Productions, no less): Charlie Sheen.